Central Ajax progressed to the Challenge Vase semi-final after beating Midland League Division Three leaders Coventry Plumbing 3-2 at Ajax Park. The hosts started brightly and opened the scoring in the tenth minute courtesy of centre-half Adam Trinder. 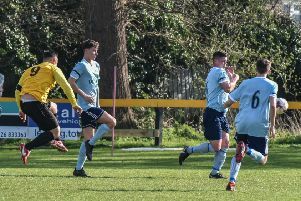 An inswinging Lewis Fathers free-kick was met by Adam Miles who helped the ball across the goalmouth to Trinder who prodded home from three yards for his first goal of the season. Matt Layton celebrates scoring Ajax's second goal with Adam Trinder. Ajax doubled their lead in the 21st minute when Matt Layton picked up a loose pass from the Plumbing centre-back before chipping the keeper from 25 yards to register his sixth goal of the season. There was a real end-to-end feel to the game with both teams looking to play quick, incisive football. Fathers had a long-range effort fly narrowly over before Plumbing hit the post from a shot from distance just before half-time. Plumbing’s prolific striker Connoll Farrell also had two good chances either side of the break, firstly driving wide from the left-hand side of the penalty area and then seeing Ajax keeper Craig Lawrence smother his low shot in the opening minute of the second half. However, it was Ajax who scored the third goal of the game when a Jack Keeling shot from the edge of the box was parried out to Adam Trinder who scored his second from close range. With a three-goal cushion, the home side switched off in the last ten minutes and conceded two headed goals. The first was scored by Toby Dipper who rose highest from a left-wing corner and then, in the 85th minute, substitute Jordan Powell scored from another left-wing cross. Plumbing had a penalty appeal turned down in the final minute after a coming together of two players in the penalty area but it was Ajax who clung on to the lead to book their place in the last four. Ajax return to league action on Saturday when they entertain Castle Vale Town.